(Nanowerk News) Nanomaterials – at a scale of one thousand times smaller than a millimetre – offer the promise of radical technological development. Many of these will improve our quality of life, and develop our economies, but all will be measured against the overarching principle that we do not make some error, and harm ourselves and our environment by exposure to new forms of hazard. 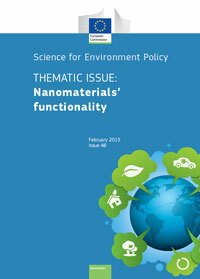 This Thematic Issue ("Nanomaterials’ functionality"; free pdf download) explores recent developments in nanomaterials research, and possibilities for safe, practical and resource-efficient applications. Several articles in this Thematic Issue illustrate how nanotechnology is likely to further revolutionise that arena, for example in capturing sunlight and turning it into usable electrical energy. The article ‘Solar cell efficiency boosted with pine tree-like nanotube needle’, describes how light collected from the sun can be bounced around many times inside a nanostructure to improve the chance of it exciting electrons, and ‘Nanotechnology cuts costs and improves efficiency of photovoltaic cells’ shows how electrons that are released can be captured by the large surface area of ‘nano-tree like’ anodes. Together these ensure that more of the sunlight is transformed to captured electrons and electrical power. The article ‘New energy-efficient manufacture of perovskite solar cells’ goes further, and suggests that the existing titanium dioxide that is currently used in solar cells could be replaced by perovskites, yielding quite dramatic improvements in energy conversion, at low device fabrication costs. The article ‘Pomegranate-inspired battery design doubles stored energy’ shows another interesting example suggesting that with nano-engineering the space around anodes will prolong the life, and safety, of batteries. The efficiencies and improvements implied by these examples are sufficient to illustrate how the design and engineering of structures on the nanometre scale could change markets, and make a better, cleaner and safer environment. Few doubt that the advent of compact and cheap 3D printing, in which nanoparticle ‘inks’ are merged together by heat or light to form solid structures, will change our world. One will see much of what was produced in a factory, from furniture and decoration to the very structures of homes themselves, becoming personalised, individually designed, and made in small companies, or at home. Many of the new ‘inks’ necessary for metallic, ceramic and polymeric composites will be novel nanoparticles. Furthermore, the article ‘New 3D printing technique for environmental nanodevices’ is a good example of how processes also, such as the old-fashioned spinning mill from the previous century, are being transformed into an inexpensive and fast desk-top nano-scale 3D fabrication process. The article ‘New quantum dot process could lead to super-efficient light-producing technology’ describes how anisotropic (elongated, non-spherical) indium-gallenium nitride quantum dots, or proximity to an anisotropic surface, can lead quantum dots to emit polarised light, potentially enabling 3D television screens, optical computers and other applications, at much lower cost. ‘The potential of new building block-like nanomaterials: van der Waals heterostructures and ‘Graphene’s health effects summarised in new guide’ touch on the possibility of engineering ‘building block-crystals’ by arranging different 2D nanostructures such as graphene into low dimension crystals, which allows us, for example, to lower the loss of energy in transmitting electricity. There are also quite novel directions underpinning ‘green nanochemistry' — illustrated by the potential of silk-based electronbeam resists (in the article ‘Making nano-scale manufacturing ecofriendly with silk’) — to be eco-friendly, and have new functionalities. The article ‘Low energy water purification enabled by nanomaterial-coated sponges’ reports on structures at the nanoscale (a ‘nanosponge’), capable of focusing an applied electric field to more readily puncture the membranes of bacteria that have contaminated water. The article is intriguing not just because of the science, but because it illustrates the point that nanotechnology can make disinfection both safer and less damaging to the environment. However diverse, all the articles share a common theme – the key enabling properties are a result of the manipulation of structure at the nanoscale.